For my ROM back then, I had gotten the tuxedo bridal nails for my pedicure and funky pink nails for my manicure. This time, I decided to go for a more shunu feel! HAHAHHA. I stayed simple and sweet! Believe it or not, these are my real nails! I grew my nails extremely long for the wedding! However, my nails were a bit weak so Corine did a gel overlay! The nail colours were gelish colours! Corine used the 3D powder to scalp ribbons for me. She also added some bling! Love the end result! Simple, classy and "shunu". Liyen gave me a french pedicure. Didn't do any design or bling as I would be wearing peep toe heels on #nadskai1314! 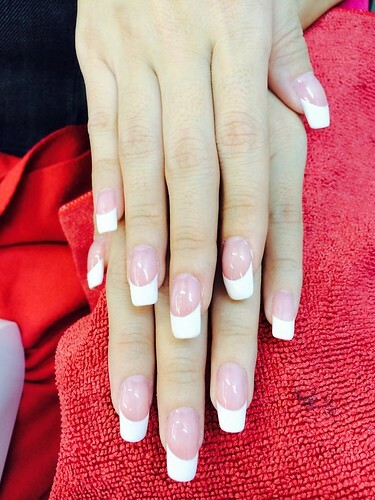 For prospective brides, do get your bridal nails done at Milly's! Posted in #nadskai1314, #project1314, Beauty, Nails, Singapore Beauty Blog, Singapore Lifestyle Blog, Singapore Wedding Blog, Sponsored, Wedding, Wedding Nails, Wedding Preparations. Tags: beauty blog, Beauty blogger, bridal nails, creative nail art, gelish nails, lifestyle blog, milly's, Milly's Beauty SG, millys girl, nadnut, nadnut nails, nail art, nails, nails blog, nice nail designs, singapore beauty blog, singapore lifestyle blog, Singapore Wedding Blog, Singapore Weddings, Wedding Nail Designs, Wedding Nails on March 9, 2014 by nadnut.